Emerging as one of the top players in the game and a driving force for the Boston Red Sox, Mookie Betts is primed for big things on the field and in the hobby. While the Mookie Betts rookie cards moved a little slower at first, they are surging now. Most prospects seem to get their initial cards within a year of being drafted and signing their first pro contracts. With the expansion of USA Baseball sets, this is often even earlier for top prospects. 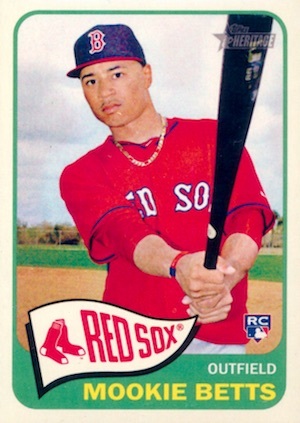 However, that wasn't the case with Mookie Betts rookie cards. 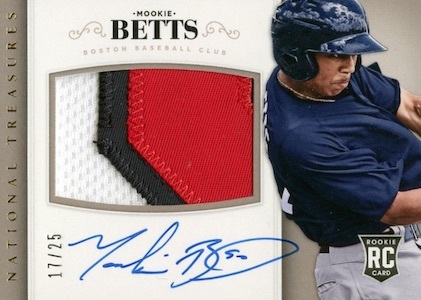 View Mookie Betts card auctions with the most bids on eBay. Despite being drafted in 2011, he didn't get his first cards until late in 2013. His earliest cards in a Red Sox uniform can be found in 2014. 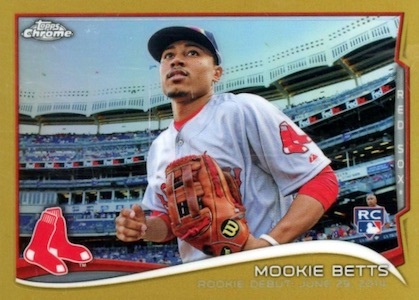 While they came later in the MLB season, the 2014 baseball sets also offer the Mookie Betts rookie cards. 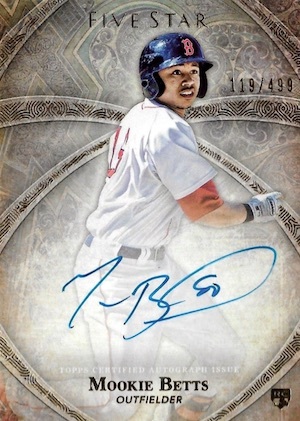 Review all the Mookie Betts rookie cards below in our detailed checklist and gallery. After that, we dive into some of his key prospect cards. 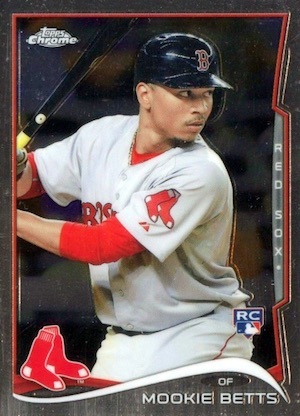 The main Mookie Betts rookie card in 2014 Bowman Sterling might not seem like a very notable option, but with just a few base cards in every box, it can be very difficult to uncover in packs and is in limited supply on the secondary market. Adding to the overall numbers, Betts is also in the base rookie autograph set and the Sterling die-cut autograph insert (#/50). Along with the base rookie, all three cards have multiple Refractor parallel tiers. 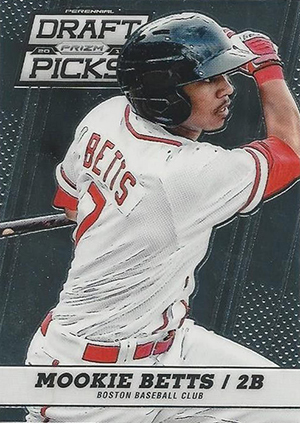 Home to a very simple Betts rookie, 2014 Classics is arguably the most generic of the bunch. If you just want a cheap rookie card, this is a solid choice. His Significant Signatures card carries a sticker autograph and a print run of 299. Just like Classics, 2014 National Treasures is airbrushed to remove all logos for the Boston Baseball Club. While the awkward photo angle does it no favors, the card is still notable give the NT brand name, on-card signature and considerable rarity. 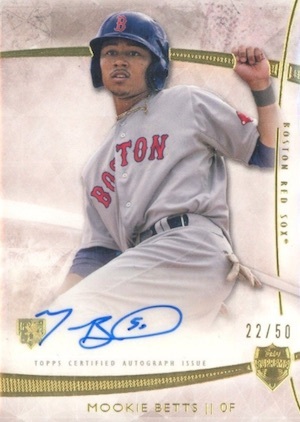 Betts has several additional autographed cards in 2014 NT, as well, including the die-cut baseball-style card that is hard-signed and also limited to 99 copies. 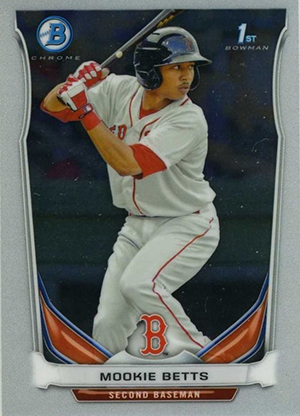 Betts missed the cut for the main Topps Chrome, but he was included in 2014 Topps Chrome Update, the exclusive retail release found only in Holiday Mega Boxes. These are basically just chromium versions of his flagship rookie from Update Series. He also has a Rookie Debut card (#46) in the same set. Parallels for both include Gold (#/250) and Black (#/99). 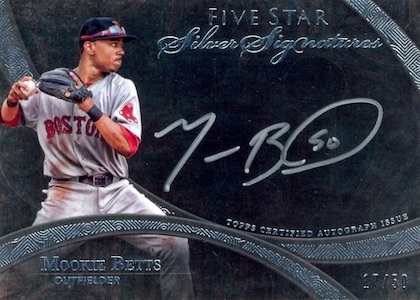 The premium 2014 Topps Five Star is all hits, which means multiple Mookie Betts rookie autographs. 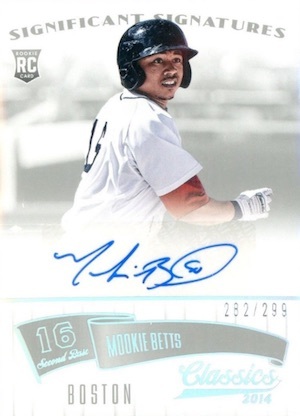 Joining the on-card base rookie autograph, which has 499 copies, Betts is part of the hard-signed Golden Graphs and Silver Signatures lines, each numbered to 50. 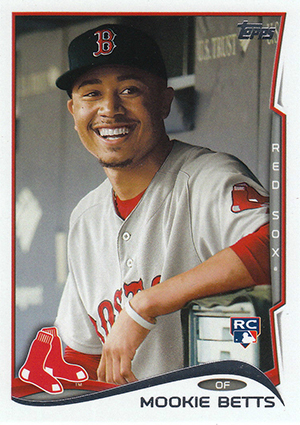 Included in the 100-card factory set that builds on the main Heritage product, the 2014 Heritage High Number Mookie Betts rookie card has become a hot commodity. Helped greatly by the factory-set format, prices have surged quite a bit. 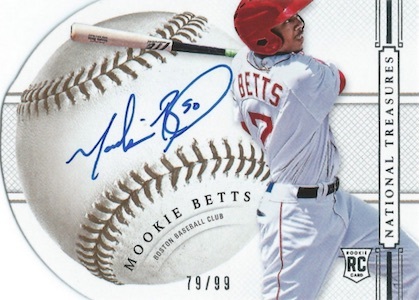 Even more valuable is the on-card Real One Autograph for Betts that uses the base design, especially the red ink version that is hand-numbered to 10 copies. 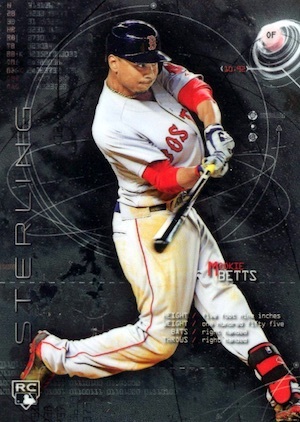 Another option with a base rookie and a hard-signed edition, 2014 Stadium Club features an action shot of Betts. Both rookies have several foil parallels, as well. Found in the main 2014 Supreme autograph checklist, the base on-card autograph print run of 50 is very low, but it can be a little misleading. Eight different parallels bring the overall number to 210 copies. Still, the relatively limited supply can make it tougher to track down specific versions. 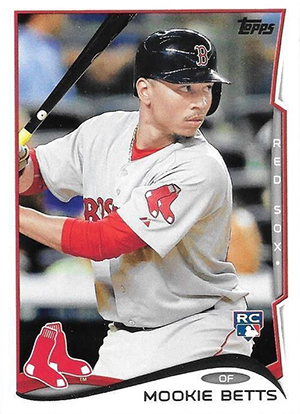 Easily the most mainstream and plentiful of the Mookie Betts rookie cards, 2014 Topps Update Series works with a base batting image. This is joined by his Rookie Debut card (#301) as well as a short-printed image variation that shows Betts smiling in the dugout. 2013 Panini Prizm Perennial Draft Picks is the first major product to have Mookie Betts cards. The prospect-focused set has plenty of colorful parallels that make for a nice chase. Because it's not licensed by MLB, Betts is pictured in a somewhat generic uniform, although the angle obscures it fairly well. The card is very affordable. One of the main draws of 2013 Prizm Perennial Draft Picks is that it has a larger autograph checklist compared to the competing 2013 Bowman Draft. 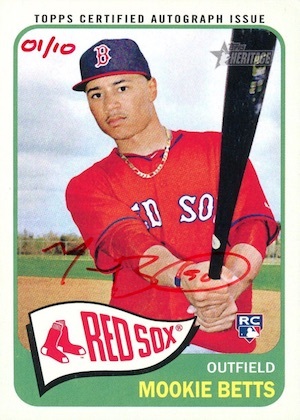 This is evidenced by Panini landing Betts and his signature months before Topps. Featuring an on-card signature, the base version is not serial numbered. However, there are several Refractor-like parallels that are numbered. Despite being out first, the lack of MLB license and brand recognition make it cheaper than the 2014 Bowman Chrome Mookie Betts autograph. 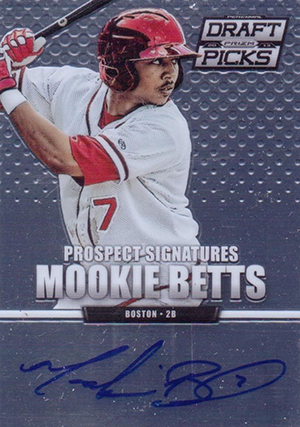 Mookie Betts' 2014 Bowman Chrome Prospects card is an insert so it's not a rookie card in a traditional sense. However, it's still widely traded. It's also a much cheaper option than the autographed version. Included in 2014 Bowman Baseball, it has a bunch of Refractor parallels. There's also a basic Bowman version of the card but the Chrome card is still cheap enough that it's a more popular choice. 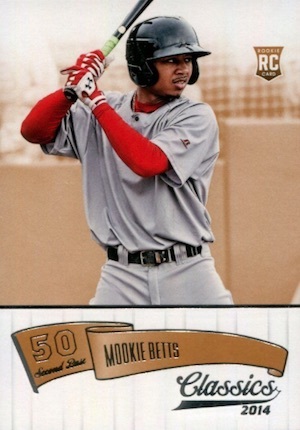 2014 Bowman Baseball also has a mini Mookie Betts card. 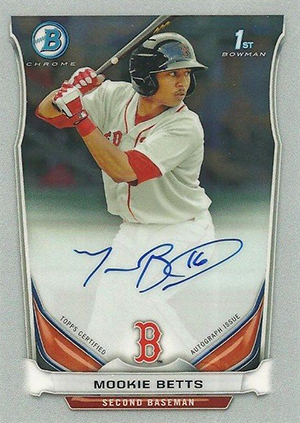 If you're going to collect Mookie Betts cards, the 2014 Bowman Chrome Prospect Autograph is considered by most to be a cornerstone. It's his first certified autograph in a Red Sox uniform and carries with it the Bowman Chrome clout. Like the unsigned version, the card has several Refractor parallels. 2014 Bowman Chrome Mookie Betts #119 250 Blue Refractor Rookie GMA 10 Gem Mint!